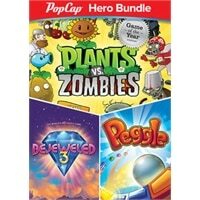 Play the games that helped make PopCap a household name. Whether you're matching gems, clearing pegs or repelling zombies, you'll be caught up in the addictive gameplay. Find your perfect match with 8 breathtaking game modes that meet all your moods - ease into Classic Bejeweled for cascades of fun, journey through 40 challenging Quest puzzles, charge into the electrifying Lightning for non-stop action, and tailor your experience in Zen for a revolutionary way to relax. Enjoy the amazing sights and sounds and engage in endless gem-matching fun, and earn flashy achievement badges as you soar to dazzling advanced heights! Shoot and clear the orange pegs to achieve Extreme Fever as 10 outlandish teachers help you rise to greatness. Conquer 55 levels and wield 10 Magic Powers in Adventure mode. Put your skills to the ultimate test with 75 challenges as you rack up bonus points. Face off against friends or the computer in Duel mode. Zombies are invading your home, and the only defense is your arsenal of plants. Armed with 49 zombie-zapping plants like peashooters and cherry bombs, you'll need to think fast and plant faster to stop 26 types of zombies dead in their tracks. Obstacles like a setting sun, creeping fog and a swimming pool add to the challenge, and with five game modes to dig into, the fun never dies! Find your perfect match with 8 breathtaking game modes that meet all your moods - ease into Classic Bejeweled for cascades of fun, journey through 40 challenging Quest puzzles, charge into the electrifying Lightning for non-stop action, and tailor your experience in Zen for a revolutionary new way to relax. Enjoy the amazing sights and sounds and engage in endless gem-matching fun, and earn flashy achievement badges as you soar to dazzling new heights! Shoot and clear the orange pegs to achieve Extreme Fever as 10 outlandish teachers help you rise to greatness. Conquer 55 levels and wield 10 Magic Powers in Adventure mode. Put your skills to the ultimate test with 75 challenges as you rack up bonus points. Face off against friends or the computer in Duel mode. It's an epic blend of luck and skill that msnbc.com calls one of the "Top 5 most addictive video games of all time!"